Not the perfect start to a travel story, right? Wrong. This is the real deal. Entebbe. Until this trip happened, it had not hit me that Entebbe is the main airport in Uganda, even with the movies made about the hijacking in 1976. I always thought Kampala had another. It’s like JKIA being in Limuru. I am not even kidding you. It takes about 50 minutes to fly to Entebbe. So when you get your stamp and head out through security, you realize how small the place is compared to where you came from and that you are 40km away from your destination. Also, the cars here are slightly older than the ones you see in Nairobi, but it is another Toyota land. A lot of Ubers and Taxifys are Spacios, Ipsums, Raums and whatever other Toyota that is in this family of cars. The driver educated me a lot during that one hour trip in the middle of the night. Apparently Toyota Wish is now taking over the taxi industry and the people who run the country are about to pass a bill reducing the age of cars allowed into the country like us. Petrol stations. They. Are. So. Many. The whole stretch from Entebbe to Kampala probably has a hundred petrol stations. Or more. Or I am just exaggerating. One person told me it’s because no one travels on full tank here, so they need to have filling stations everywhere when the inevitable happens. There is a good amount of road construction going on to fix the traffic situation this side, but because kids were on holiday, I did not get to see the famed traffic in action. So we get to Kampala Boulevard, our home for the week and who welcomes us? A napping security guard. No surprise there. I announce our final destination and he offers to walk us up. I almost fall over when he gets up and turns around. A huge AK 47 is hanging from his shoulder across his back. I look at my colleague in disbelief and she gives me the you-ain’t-seen-nothing-yet look – she has travelled to Uganda a lot before. I will have to do further research into how much safer Uganda is with guns as compared to Kenya and our detectors that I have always doubted do much at all those entrances. The suite is real nice with a great view of this side of the city. The buildings are not as high as Nairobi’s. It’s also not cold. The warmth that I experience the next couple of days just makes me want to stay longer. Even when it showers, the change in temperature is minimal. 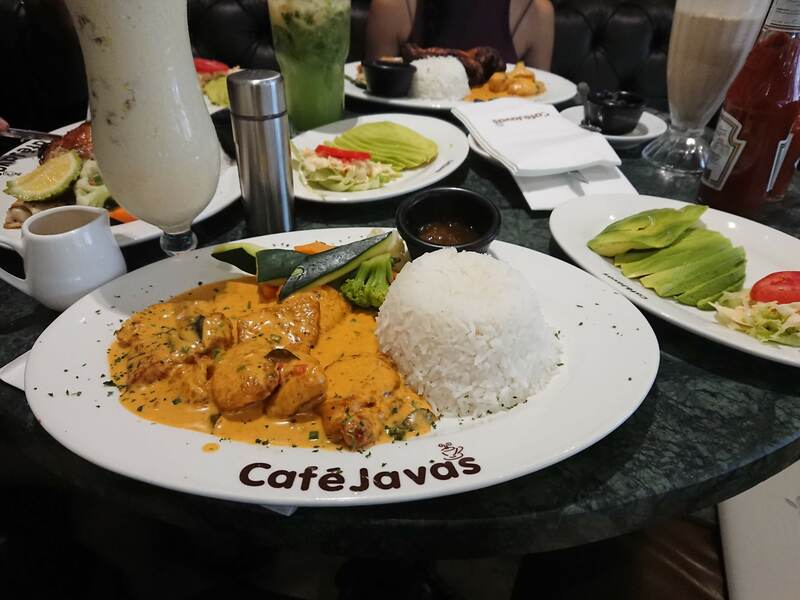 Café Javas. My friends. Have you sampled CJ’s on Koinange Street yet? You know, the beautiful new restaurant that’s almost all glass with the most beautiful popping menus I have ever seen and equally good food and service? Well. You ain’t seen nothing yet until you go to one of CJ’s mothers in Kampala, Café Javas. And in case you did not know why it is CJ’s, the two had previously fought the trademark battle in court in Uganda when Java was seeking to register its trademark in the country. Java won and now has branches in Kampala. We already know Uganda is very agriculturally rich, right? I mean, we nearly wept on our way back to the airport looking at tomatoes the size of fists sitting pretty in the sun in various markets along Kampala-Entebbe Road. Meanwhile, we’re buying beat-up tomatoes like gold on this other side of Lake Victoria. Sigh. Anyway, back to Café Javas. In addition to the huge servings you get, with additions that make you want to ululate in exhilaration like Njugush, it is still cheaper than its equivalent in Kenya. I literally camped here the whole week, despite how packed it could get. Juzi I got a milkshake from Java and I wanted to cry. I felt so cheated. It suddenly felt watery. The shakes at Cafe Javas are heavenly. Did I mention the Pina Coladas! (Without rum, of course.) I guess I will never look at anything food related the same way again after Uganda. LOL. It suddenly makes more sense why the British with all their resources insisted on cutting through thickets, man-eaters, tribes with different temperaments, mountains and rift valleys to get to Uganda, the Pearl of Africa. I cannot even begin to get jealous. Idi Amin really did some serious injustice to the country. Museveni. My fellow Kenyans, I was mistaken about him. This president is brilliant, very sharp and focused for his age (73) and he does not read speeches. At least he did not read one here. We were at the Africa Blockchain Conference when I changed my mind. Let’s try to forget that our gadgets had to be taken away because he was in the building and focus on this: He was speaking about blockchain and cryptocurrencies from a very informed perspective, referring to handwritten notes he had been making throughout. Before he stood up to speak, the Bank of Uganda governor had read out a very scary speech which had me wondering why we were there in the first place. You know, the usual we will not entertain anything that is about crypto because it is scam. Enter the president. He urged the governor to be more inquisitive about such technologies – not to be dogmatic – and then broke down the blockchain concept in such an easy-to-understand way that I felt challenged. I have been doing everyone who has asked me about bitcoin and blockchain an injustice the past four years. I can now break it down in one simple sentence from the president: The blockchain is like a global organization/sacco in which people trust each other, put everything in public record books so that anyone anywhere can know how many bulls Museveni has in I-don’t-know-where. He spoke a lot of Baganda too, so 5% of the jokes were lost on that. Allow me to digress a bit. For some strange reason the conference organizers chose to have scams over too, exhibiting and all that. And that is exactly who the Ugandan media chose to interview too. This beats the whole point of trying to educate people about the benefits of new technologies. Dear Ugandans, please stay away from OneLife/OneCoin and any other thing that cheats you out of your money. Seriously. Fight the urge to get easy money. I mean, even a simple Google search tells you what is a scam and what is not very easily. The funny thing is we keep telling people to stay away from these schemes, even in Kenya, but get-rich-quick schemes always have followers. And things always go south. End of digression. At one point, we went to this French place in a very upmarket part of Kampala. Holy Crepe. From the moment we sat down, in addition to a beautiful view of the residential Kampala, all we saw were people jogging up and down the hill. At 5PM. I found that very strange. At another point, a friend took me to another hotel, Mestil Hotel & Residences. I would expect the prices to be off the roof, and again, I was shocked. A good meal here ranges from USh 28,000 USh to 35,000 UGX. Brethren, this is way under KSh 1000. Sijui nirudi Uganda? But on the other hand, that money is confusing. You have so many zeroes in your pocket, but you literally have very little money. It confused me the whole time I was trying to pay for some stuff. I had to keep reaching out to Google to help me convert to Kenya Shillings to see if I was being ripped off. Then every time you get into a taxi (apparently, they also refer to matatus as taxis), the driver will close the windows very fast and rhetorically ask if you want your phone to be snatched. Turns out this is the order of the day in Kampala. Nairobi you are not alone. I also gave up on Uber here and stuck to Taxify. For some reason the latter drivers have it together than their Uber counterparts. Also, there is no way I am spending my life on bodas. Bodas are so part of the system, there is UberBoda. I had to get on bodas thrice that week. The first time, I felt like I was going to go nuts. I never touch the rider leave alone hold on to him, so I have to find something to grip behind me. And all along way, you see women sitting sideways on these things. I am like, are you kidding me? And helmets are not a thing here either. The second time was riding down to Owino market because everyone in Kenya could not shut up about that place. First of all, it’s not all that but clothing is actually pretty cheap. Everything is under 1000 bob. No one has a mirror or a fitting room when you try on stuff because apparently, they are all doing it wholesale. *Rolls eyes repeatedly* I did not spend too much time here, because we were running a tight schedule, but it reminded me of a lesser organized Eastleigh. And that is saying a lot because Eastleigh is NOT organized. Did I mention the seller dudes who grab your arms and not let go like they are your boyfriends? That annoyed me bigtime. Hata afadhali makanga wa Kenya sasa. Also, people in the market try to speak some Swahili unlike everyone else Kampala. Or probably these are just the same Kenyans we know here. I might keep going on and on – the little bit of Uganda I experienced felt so different yet so much like home – so let me stop. And I bet I only caught a glimpse – I have not done the city any writing justice. Yet. You can only learn and see so much in a few days. Hahaha! Your travel drama is legit. Looking forward to more posts about your trips. 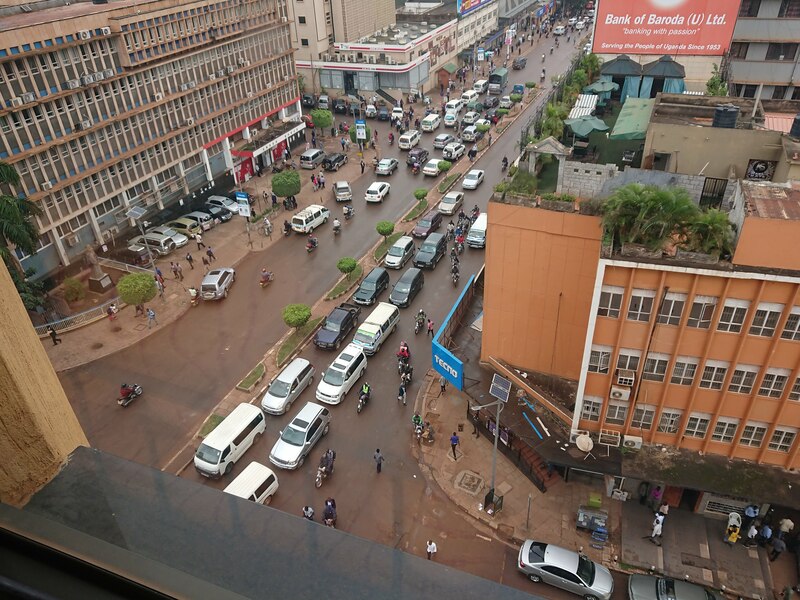 Definitely a new side of Museveni they dont say….hehehe..Jinja tunaenda lini? Haha!! Keep travelling and be our eyes in the corners we can’t reach. Then craft your journeys into fine literary works like this piece.Thank you for this piece! !